To enjoy a good brunch with all the flavor of spinach, mushrooms and cheese quota that we all love. eye! No crust, because with the dose of cheese is enough force. Don’t let a minute go by thinking about what to cook for lunch today. 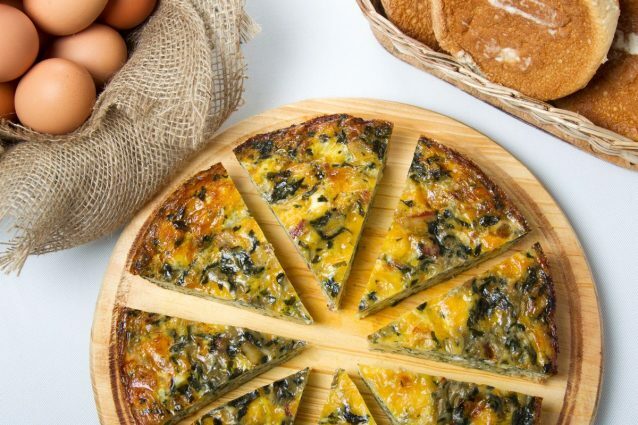 A good brunch can also be enjoyed with this version of quiche without crust, which will fascinate you with its mix of spinach, mushrooms and a generous measure of cheese. Accompany this marvel with a good coffee that will complete the dose of flavor you need every day to start working with energy. 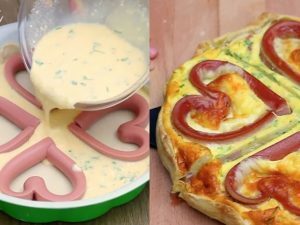 This quiche without crust can also be made with other ingredients, such as asparagus, green beans, peas and zucchini. You can substitute the ham for bacon with low fat, chopped. Wash the spinach very well, remove the stems and keep the leaves. Dry them with paper towels. Then chop them into small pieces. 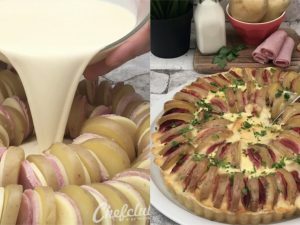 Peel the onion and cut it into brunoises, as small as possible. Cut the bacon into small strips. Heat a non-stick pan, or the one you have and add a little oil, the bacon loses a lot of fat so it will not be necessary to add a lot of oil. Fried quickly in a little hot fat the bacon and onions. Then add the cut spinach. You must cook for at least ten minutes; this will help the spinach leaves evaporate excess water and your quiche will have a firm consistency. In a bowl mix the cream with the eggs, and then add the mixture of spinach, onion and bacon. Pour the whole mixture on the baking tray, and finally add the chosen cheese on top. Bake for about 25 minutes or until the quiche is browned on top. 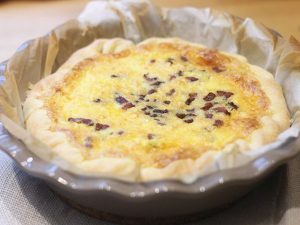 Leave the quiche at rest for 10 minutes, cut into slices with a sharp knife. The quiches are delicious for breakfast, accompanied with bread and coffee.